Choosing the right legal structure will help you reduce personal liability, access proper capital investment, lower your company’s tax burden and avoid unnecessary regulatory requirements. A sole proprietorship refers to the person who owns a business and is personally responsible for its debts and liabilities. Anyone who has not formed a legal structure and does business as a freelancer or contractor is considered a sole proprietor. Although this does not form a separate legal entity, the sole proprietorship is still responsible for complying with all applicable registration, license, and permit laws. 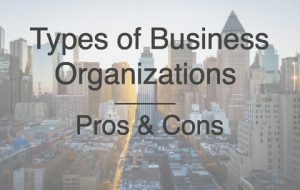 For these reasons, most entrepreneurs will want to graduate their company from a sole proprietorship to a more formal business legal structure. A partnership is formed when two or more people start a business with a goal of making a profit. No legal documentation is required to form a partnership, although it is highly recommended that a partnership agreement is created. Because of the power each partner has over the partnership, avoiding and efficiently handling disagreements is critical for the success of the group. Once the benefits of a partnership no longer outweigh the risks, many Entrepreneurs choose to form an LLC or Corporation. In fact, most provisions in a partnership agreement can be replicated in the operating agreement of an LLC. Becoming an LLC allows partners to reduce risk personal risk, without having a significant impact on the day to day operations. If it is decided that a partnership should be kept in place, you should consider insuring the partnership to cover potential debts or liabilities. A corporation is much more complex and expensive to set up, but allows shareholders to separate company debts from personal assets. The corporation is legally considered an independent entity that is separate from its owners. Corporations are not required to dissolve after a owner dies or quits. Federal, state, and many local agencies monitor corporations and often have different regulatory requirements, ultimately increasing compliance costs. A common approach corporations take to manage double taxation is to pay shareholders of the company ‘reasonable’ compensation in the form of a salary. These costs can be deducted as a business expense, but the IRS monitors this closely and will result in significant fines if done incorrectly. It is very important to have a trusted legal team in place to reduce your tax burden and keep your corporation in good standing with all regulatory authorities.